Although they needed the latest goal ever scored in a game by the club to earn a draw Leeds United boss Marcelo Bielsa felt that was the least his side deserved in their big Sky Bet Championship game at Middlesbrough. Trailing to a Lewis Wing goal early in the second half, United produced a strong response to ensure they would not lose for the second week running against promotion rivals. But it was not until the 11th minute of injury-time that Kalvin Phillips headed home from close range to earn the 1-1 draw. 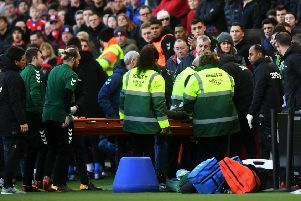 The massive added time came after the game had been delayed for seven minutes in the second half while paramedics tended to Leeds winger Jack Clarke, who was taken ill on the bench after being substituted by Bielsa at half-time. Clarke was taken to hospital and had tests, but positive news came out of the Leeds camp last night when he had recovered sufficiently to be able to travel home. Bielsa played down concerns about Clarke’s health when speaking to the press straight after the game and on the match itself he said: “We suffered in the first half as the opponent was dangerous. But the end of the first half and the second half were good. We could have won the game. “If we take into account the 15 minutes of the first half where we were not at ease, apart from this segment I think we dominated and created chances. We deserved to score this goal and deserved to score other goals. United defender Pontus Jansson hit the post during the second half and Patrick Bamford, on his first league start for Leeds, against the club he left them for, missed a clear chance on the rebound. It was not looking like United’s day until their fortunate change with a late corner. Ezgjan Alioski’s flag kick was headed on by skipper Liam Cooper and nodded home by Phillips for his first goal of the season to take Leeds back to the top of the table for 24 hours at least - and crucially keep them seven points ahead of Middlesbrough. The home team created the better chances in the opening half and were unlucky to still be goalless. 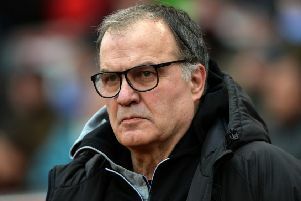 Marcelo Bielsa had made three changes from the team that lost to Norwich with Phillips, Bamford and Clarke recalled at the expense of Tyler Roberts and Pablo Hernandez who dropped to the bench and Adam Forshaw who was injured. But it was a difficult start for the team as keeper Kiko Casilla was forced to make two saves to deny George Saville strikes from outside the area. Casilla then completely misjudged the flight of a Saville corner and was fortunate to see big defender Aden Flint somehow head over from virtually under the crossbar. Middlesbrough looked certain to score when George Friend got in down their left and his cross picked out Ryan Shotton, but his fellow full-back lost his balance and shot wide with only the keeper to beat. Lewis Wing went close with a shot from just outside the area before Bamford had the first real chance for the Whites only to shoot wide when free in the box to meet Jack Harrison’s pass. Bielsa made his now traditional half-time substitution, this time bringing on Hernandez for Clarke. But before he could have any impact the hosts were in front, Wing being unmarked and having time to measure his shot past Casilla after meeting Friend’s low cross. Leeds’ response was good and they gradually began to dominate the remainder of the match. Substitute Tyler Roberts sent the ball wide from a corner and Boro keeper Darren Randolph was forced into a double save to deny Kemar Roofe. Next it was United’s turn to curse their luck as Jansson’s glancing header from Harrison’s cross hit the post and somehow Bamford poked the ball wide from the rebound with the goal gaping. It was all Leeds in the closing stages with their opponents tiring and they got their reward deep into stoppage time through Phillips. Middlesbrough: Randolph, Shotton, Ayala, Flint, Friend, Mikel, Howson, Saville (Clayton 78), Fry, Wing (Besic 64), Hugill (Assombalonga 77). Subs: Dimi, Clayton, Assombalonga, Fletcher, Downing. Van La Parra, Besic. Leeds: Casilla, Ayling (Shackleton 80), Jansson, Cooper, Alioski, Phillips, Clarke (Hernandez 45), Klich (Roberts 58), Roofe, Harrison, Bamford. Subs: Peacock-Farrell, Roberts, Hernandez, Brown, Davis, Shackleton, Halme.